Miso Crafty Knits: Got Needles? I don't think I ever blogged about it, but for Christmas I had bought myself a Knit Picks Harmony Wood Interchangeable Circular Needle set. Since I've stopped using straight needles (sooo chunky and awkward...not to mention not at all handbag friendly) I've been forced to purchase circular needles pretty much every time I start a new project. I was sick and tired of not only having to hoof it over to the Beehive or Knotty By Nature to get the right needles, but I was also throwing down my son's college tuition money to buy the same needles but in different cable lengths (ok, I'm exaggerating here. I'm not touching my son's education moola to support my knitting habit...but you get the idea!). After much conversing about the benefits of an interchangeable set at my knitting group, I finally buckled down and got myself a set and couldn't be any happier for it. Yes, I still use the other needles (a few are pictured above) since the smallest needle in my Knit Picks set is a US4 (3.50mm) and the shortest cable length is a 24", the others are still well loved. 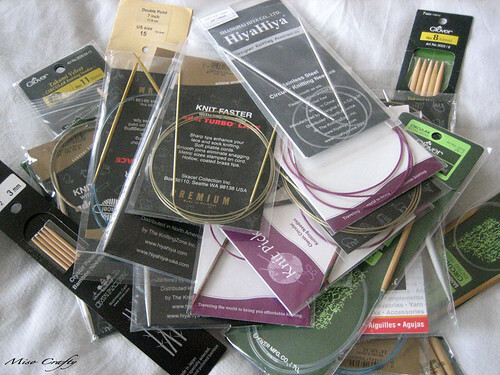 But if it were up to me, if I don't have the needle size needed in an Addi, I immediately head over to my Knit Picks. As Judy from my knitting group claims, the colorful Harmony Wood just puts you into a happier mood. I simply can't argue against that, it really does! 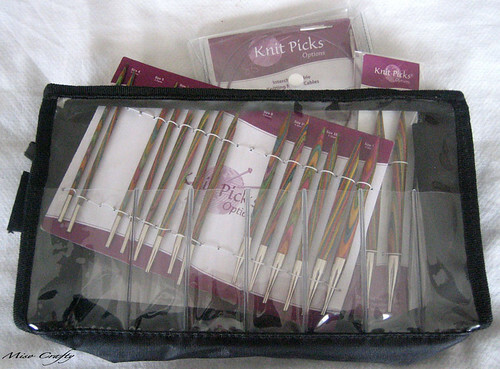 So far I have nothing bad to say about the Knit Picks set, other than the fact that I'm disgruntled that a smaller cable length isn't available to make a 12" circular (although, apparently you can get said cable in the UK...but shipping for it from the company is an arm and a leg!). 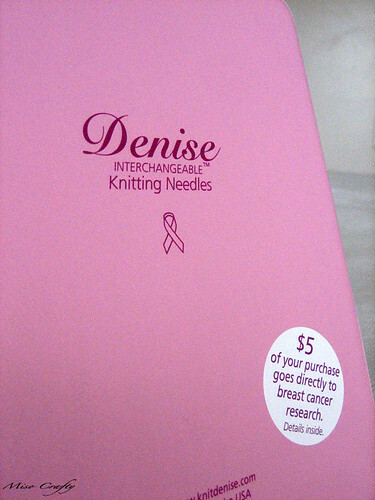 So even though I'm really happy with my KP set, it still doesn't prevent my mom from getting me the Denise Interchangeable Needle set...in pink! My mum and I had quite the lengthy phone call last week (mainly because the little one loves to shout at the phone and repeatedly says "hi" while waving, and Grandma loves to hear the little one's voice...it's a twofer!) and I had made a comment about my knitting (I forget what it was). Fast forward to today and I got an unexpected and lovely surprise package in the mail, the aforementioned pink Denise set and the companion set (re: extra cords...always good in my books!). Thanks Mum! I've heard of Denise needles before, and its followers are die-hard fans, but I've never used them myself. I'll admit that I did let out a slight squeal of glee to find that the set is all pink, black, and greys (ok, ok, it was more than a slight squeal), and was happy to discover that $5 goes towards breast cancer research. I'm very curious about the cords and how I can make circulars as small as 13" to as long as...well...as long as I want! The cords can be connected together to make any length, and with the companion set, I have 4 connectors in total. So the sky's the limit! But I will admit, I'm a little weary. The needles are very light but feel like plastic, even though they are made of resin. The cables are thicker than what I'm used to and seems almost too stiff. I don't know if Magic Loop can be done with this set. The next project that I cast on I'll be casting on with these needles and see how they feel. If I like them I'm thinking of maybe investing in the larger cables so that I can do my beloved Magic Loop. 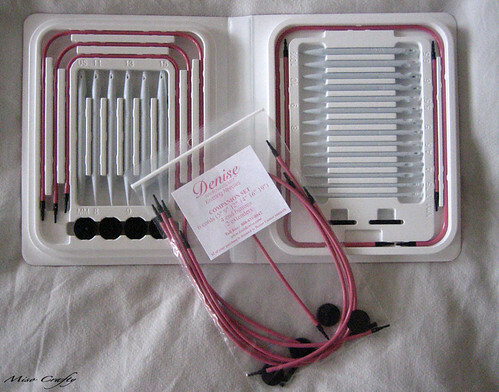 Has anyone used the Denise needles before? What are your thoughts on them? Hmmm...once I get to the new project and test them out, I'll get back to y'all. 'Til then, Happy Knitting peeps! Never used these types of needles, but would really like to be able to make socks and fingerless gloves! Is this what I would use? Well, for socks and gloves a lot of knitters suggest double pointed needles to start out with until you become comfortable. I truthfully think it all depends on what you prefer and what is easy for you to handle. I'm definitely no expert, so maybe go to your local yarn store and talk to one of the experienced ladies there? I have the Denise set. The needles are slow like plastic needles, but they feel good on your hands. I don't like using then with sticky yarn like wool, but with silk or cotton they're nice. Also very nice for colourwork. My favourite time to use the denise needles is when I'm working on something that needs a lot of different needle sizes / cable lengths. I suppose any interchangable set would work the same though. Thanks for the comment and giving me your review of the Denise needles! I haven't tried the needles on that many different fibers yet, but so far am finding that the joins are what's slowing me down. I've been finding that the little "dip" from the cable end keeps catching the stitches. But I definitely agree that the needles feel really good and are so nice and utterly light. Definitely needles I'll be using when my tendonitis acts up!